The claim to fame for the Willow Crest Golf Club is that it is a public course offering the classic dignity of a private club. For our part, we found the 3 star rating of Golf Digest to be a bit understated. 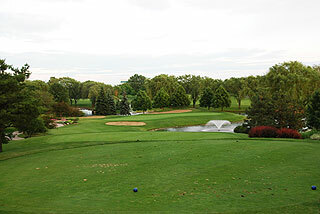 Perhaps it was the comfort and convenience of playing a course that is on property of the Oakbrook Hills Marriott Resort. No driving - fighting traffic, no hurrying around - simply grab some breakfast and walk from your room to the clubhouse. Perhaps it was the great conditioning and surprising layout - one that was challenging and yet extremely fun to play. Or maybe it was the classic willows, bridges and water hazards scattered about the course, cresting a visually pleasing environment for golf. Throw in a friendly and efficient staff and you have many reasons for playing the Willow Crest Golf Course. For more information on this resort, visit the Two Guys Who Golf page for Oakbrook Hills by clicking here. Let's begin with the resort. A stay at Oakbrook Hills Marriott Resort for any reason - business or pleasure is highly recommended. Besides comfortable accommodations, Oakbrook Hills has everything a golfer could want - and more. There are great dining options, with the main restaurant open early enough to facilitate breakfast for most early tee times. The health club has the latest in workout equipment plus a sauna and showers in each locker room, and is open from early to late. There is a spacious outdoor and indoor pool area, with a hot tub. The indoor section features two lap lanes and also provides a basketball hoop for playing water games. A beauty salon is on property, aan just outside the golf shop are tennis courts, a basketball court and sand volleyball area. Business travelers will be delighted with the business center, and the conference and meeting rooms at Oakbrook Hills provide lots to choose from. 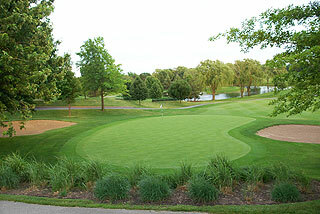 This is a great place for wedding receptions, banquets, family reunions and golf outings as well. And you only have to walk through the lobby and veer out the picture window at the 18th green to realize that this property caters to golfers! For more info on the resort - click here. 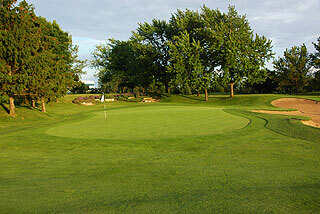 As for golf, there is a nice putting green in front of the pro shop, which is quite large for a resort golf shop. The only amenity missing is a driving range - but there are many in the area (visit our practice facilities section for the area's choices). The golf course is well marked with 100/150/200 yardage plates and sprinkler heads measured to the center of the green. Red, white and blue flags indicate the day's pin placement, and each tee box also provides measurements to the green's center. The fairways, greens and tees are nicely kept, and the rough here is very playable. This is definitely a resort golf experience. 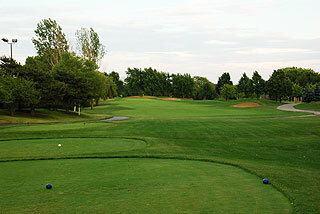 The casual or average golfer can choose the white tee areas, which play to 5925 yards and a 125 slope rating. The red tee boxes measure 4925/120 slope and the championship tees are 6400 with a 130 slope. The layout is not long, but water on 13 holes keeps it interesting. Beginners will definitely be challenged, and scratch golfers will have to play it smart to avoid the hazards. The front side plays a bit easier than the back - this is particular true of the two par fives. The opening hole doglegs left to an elevated green complex with bunkers on both sides - an easy opener. Number two presents a generous fairway, with sand traps lining both sides. There are huge bunkers front and left and a water hazard to the right on the pretty par three 3rd. A mid-range par four precedes the course's number one handicapped hole. 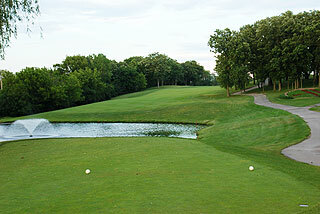 The fifth plays 509 yards from the white tees and begins with a tee shot over water to a raised fairway. Land it on the short stuff off the tee and the next two shots should land you in good scoring position. 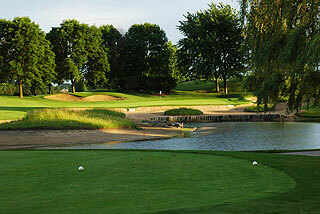 The sixth is another beautiful par three, with lots of sand and an intimidating water hazard to deal with. This is the windy city, and if the wind is up, be sure to take enough club, as long is preferable to short here. The left side of the fairway is the place to be on seven - for an approach to a well bunkered green. Be careful not to go to far right on 8, as the short fringe rolls steeply towards the water hazard. The fairway on nine is quite open, but a water hazard about 30 yards out is not visible from the approach area. Approach from the right and you are in good shape. The back side begins a par four that is quite open, and is followed by a 550 yard par five (white tees) that plays very long, especially if the wind is strong. Be careful of the pond just to the right of the putting surface. The stretch of holes from 12-14 is the easiest on the course - as they represent the 18th, 12th and 16th handicaps. A short par three and four par are followed by a pretty par three with water on both sides. There is room long, for error. Number 16 has plenty of room off the tee, but trees right and a grass swale left make the approach difficult. The tee shot over water looks more intimidating than it really is. The par four 17th is an interesting risk/reward hole. Long hitters can bend one along the water line leaving a short iron to the green, while those lacking distance should aim left of the water ansd take enough club for an uphill approach. Take the wind into consideration here ...right hand fades will end up wet. The finishing hole is a beauty! From an elevated tee area you will have to place and accurate mid iron to a putting surface fronted by an embankment that will direct anything that hits it into the water hazard. Aim for the bunkers behind the green and again - take the wind into consideration. 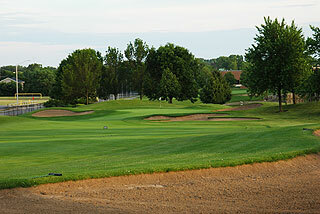 Willow Crest is not an ordinary resort golf experience. The many water hazards and sculpted bunkers will make golfers of all skill levels think before shooting. A 125 slope from the white tees indicates that course management is an issue. 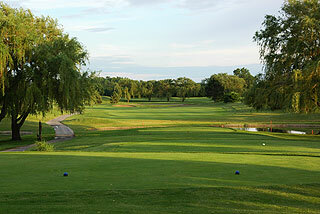 Willow Crest is not overly difficult, but it will eat a few balls if you are not striking it well. Enjoy the great scenery - which is remarkable considering the resorts close approximation to shopping, dining, etc. This is a nice course on its own - and a great experience for those staying at the resort. Highly recommended!